Sat., April 8, 2017, 10:27 p.m.
BUFFALO, N.Y. – Gegard Mousasi stopped Chris Weidman by TKO in the second round of a confusing conclusion to a middleweight bout at UFC 210 on Saturday night. Mousasi connected with two knees to the right side of Weidman’s head that stunned the former champion and led to a stoppage. Mousasi had lifted Weidman and delivered one right knee to the head, a seemingly clean blow that clearly did some damage. Mousasi’s second knee caused some of the confusion. 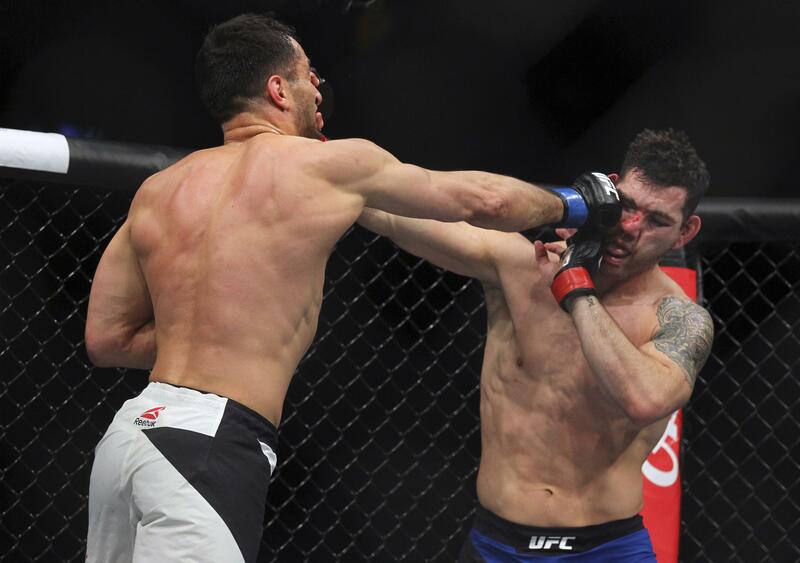 Referee Dan Miragliotta gave Weidman, who suffered his third straight loss, a 5-minute recovery period because he thought the fighter had both hands on the canvas which would make the second knee illegal. Fighters can’t deliver those knees when the opponent has two hands down. Mousasi’s first knee was clearly legal, though replays seemed inconclusive on Weidman’s hand placement on the second knee. After an extended break and plenty of commotion, doctors checked on Weidman and the fight was stopped as a packed KeyBank Center drowned out the decision with boos. Daniel Cormier was set to defend the light heavyweight championship against Anthony Johnson in the main event. Jon Jones and Rashad Evans were among the scores of UFC fighters in the house. Three months from completing a yearlong doping ban, Jones said Friday he is focusing solely on reclaiming the light heavyweight title he’s lost twice due to suspensions. Jones, one of UFC’s greatest fighters, had his eye set on the winner of the Cormier-Johnson bout for a potential title fight later this year. Cormier’s lone loss in a 19-fight MMA career came against Jones in 2015. UFC fans hadn’t fully settled down from the mess of a finish in what had been a punishing Moursasi-Weidman bout. Weidman yelled profanities as he looked at replays on the screen and believed he should have been won because of illegal kicks. “Why did they even stop the fight if it was a legal hit,” Weidman asked. Weidman lost his third straight bout following a run of 13 victories to open his career. The New York native apologized to fans who had gone wild with “USA” chants against the Dutch Mousasi. UFC was back in Buffalo for the first time New York lifted its MMA ban, and ran a card in the city for the first time since UFC 7 on Sept. 8, 1995, was headlined by Ken Shamrock and Oleg Taktarov’s fight to a ridiculous 33-minute draw. New York had shunned MMA almost since the company’s inception, and was gone for nearly 20 years once UFC 12 in 1997 was booted after the event was denied sanctioning rights. But New York hosted two big cards at Madison Square Garden and the Barclays Center in the last five months and advance ticket sales were strong for Buffalo. UFC will run a card in July in Long Island at the renovated Nassau Coliseum. Charles Oliveira, sent back to the 155-pound division because of a checkered history of missing weight in the 145-pound class, choked out Will Brooks at just 2:30 of the first round in the first bout of the main card. He made quick work in his first lightweight bout since 2011 of Brooks. Brooks buried his head in his hands and was crestfallen on a stool for several minutes after the bout before Oliveria popped over for some encouraging words. “I’m the best there is in jiu jitsu. I brought everything and I was able to do it,” he said. Thiago Alves used a stunning left hook in the first round and battered Patrick Cote’s face to point where it was bathed in blood in a unanimous decision victory. Cote (23-11) dropped his gloves and retired in the wake of the punishing defeat. “Win or lose, it would be my last fight,” he said. Cynthia Calvillo earned a submission win in a fight that was nearly scrapped over Pearl Gonzalez’s breast implants. The state athletic commission cleared Gonzalez to fight after talking to her physician. Gonzalez might have wish the fight was called off when she gave up late in the third. Buffalo Bills were seated cageside and Hall of Fame running back Thurman Thomas also was in the house. Shane Burgos, a winner in his preliminary bout, and Patrick Cummins, who lost, both were transported to the hospital for precautionary reasons following their bouts. UFC announced Urijah Faber will be inducted into the Hall of Fame in July during International Fight Week. Published: April 8, 2017, 10:27 p.m.